Handmade Vintage Style Garden Bits Just Added Today! 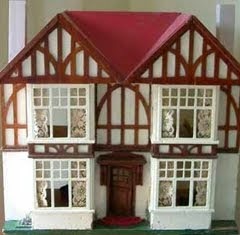 All are available to purchase and can be used with both reproduction and vintage dolls houses. 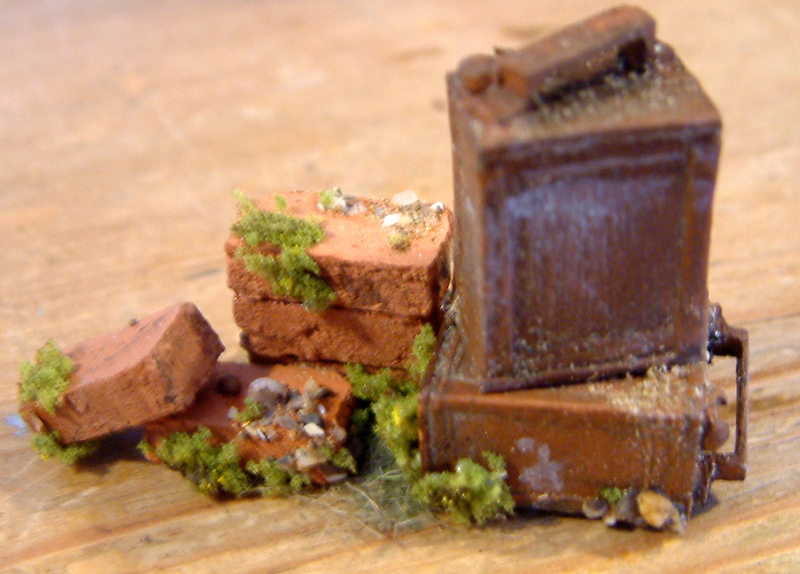 The items that have been listed today are 1/12th scale but tomorrow I am hoping to load a few 1/24th scale pieces - these will be on the same page. Below you will find a selection of the many items now available. 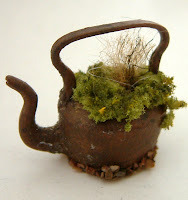 I adore the vintage cottage garden style and love to use old fashioned kitchen utensils all rusted up or slightly aged such as an enamel painted washing up bowl, old kettle, old enamel saucepan and even an old water jug. Perfect for the old vintage country garden look. 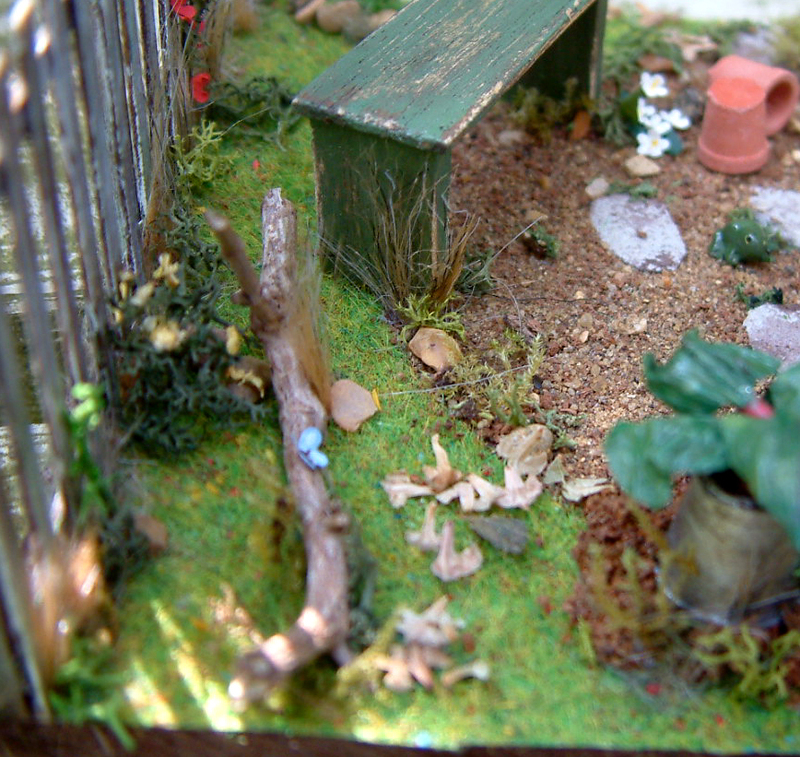 Above is one of my set pieces of an old fashioned apple crate complete with aged watering can, rusty old oil can, pots etc. 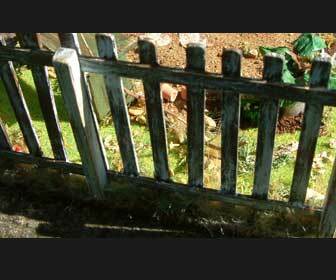 This is ideal for an old shed or outhouse scene. Now...my grandma always used to put an old saucepan of water out for the birds.....so this is where I got the inspiration for this little piece! 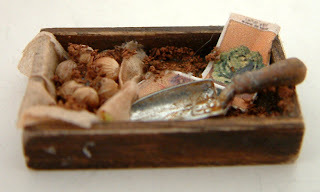 I have made many of these sorts of wooden boxes over the years with various contents....this one has an aged trowel, "bulbs" ready for planting, vintage seed packets etc. 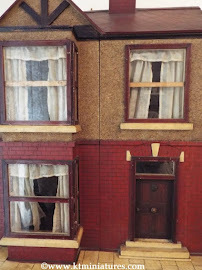 I am about to list many vintage dolls house pieces to the website over the next few days...due to the workshop last weekend, my website has been slightly static of late as time has been sadly lacking .... I have a lot of catching up to do! There are some lovely vintage goodies coming...do keep a look out. 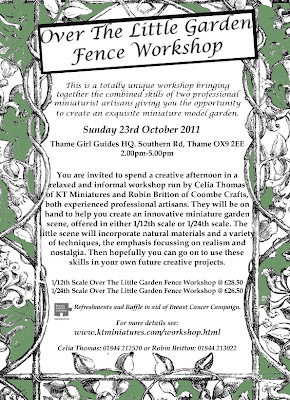 Just to say that yesterday's "Over The Little Garden Fence Workshop" was a resounding success! Robin and I were a teeny apprehensive as it was our first one....but the time flew by and it was great fun. We spent the afternoon with twenty lovely and very creative ladies.... a great time was had by all....well the feedback we have had suggests that's the case! 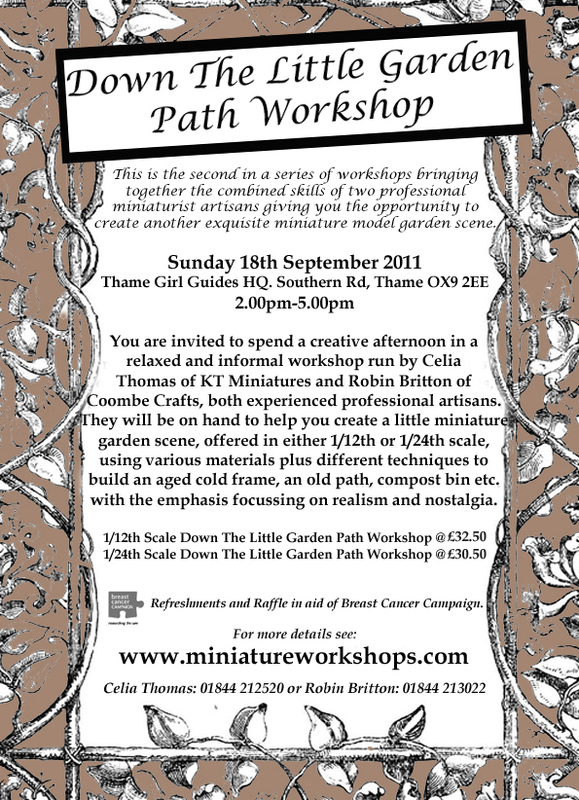 Booking is now open for our second workshop "Down The Little Garden Path". Meanwhile....here is our latest video........enjoy! PS. 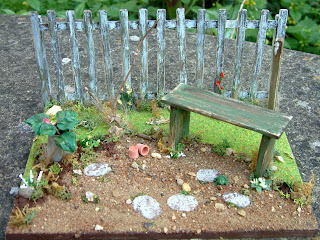 I will be loading up several handmade "outside" pieces to KT Miniatures website in a couple of days, both 1/12th and 1/24th but more about that another day. OUR WORKSHOP DISPLAY TABLE....Think Vintage, Rusty Bits, Weathered Look, Country Cottage....Nostalgia! As our first OVER THE LITTLE GARDEN FENCE WORKSHOP is being held this Sunday, some of my time this week has been taken up with last minute preparations. Everything is now complete and we are ready. Below you can see some photos of items that will be on display at Sunday's workshop ......many of which will be available to purchase. The handmde items were created by both Robin and I, illustrating a taster of things to come in future workshops. 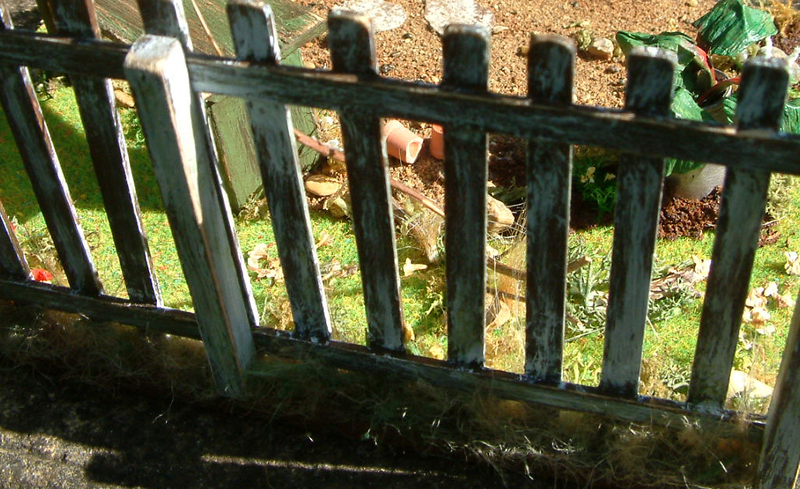 Think vintage, rusty bits, weathered look, country cottage....nostalgia! 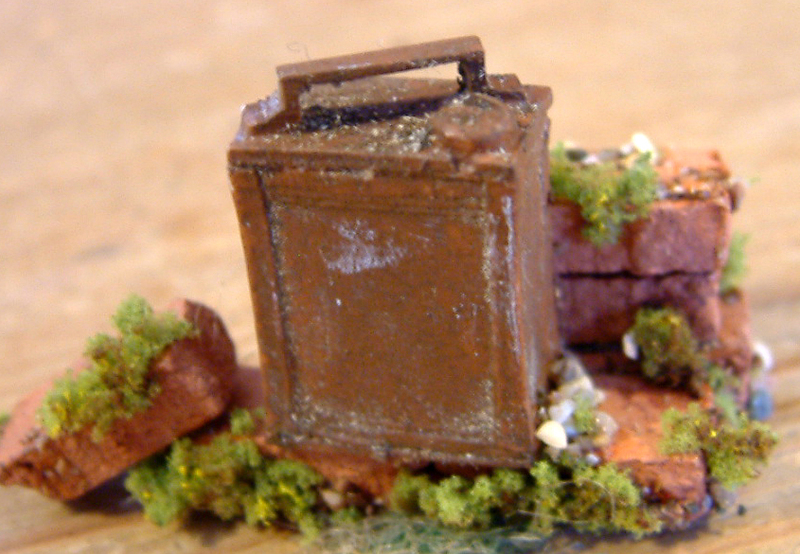 Just to say that any unsold items of mine, will be listed for sale next week on the new SHED,OUTHOUSE & OUTDOORS page under KT Miniatures' Exclusive Items Section. Meanwhile on Monday morning (27th June) booking will open for our second half day workshop project.....to be held on Sunday 18th September. We will have up to 20 spaces and booking early is advisable to avoid disappointment. SOME NEW CREATIONS - 1930s Wireless Tables & Some Bits For Your Shed etc! 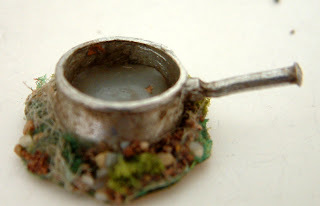 Have been at my workbench all week, working hard on a specific mini project however I did manage to squeeze in a bit of other creating and these new items have just been listed onto KT Miniatures website. Seen here is one of those creations.....a 1930s-1940s wireless table that has a bakelite effect wireless and pretty cloth sitting on top of a slightly aged wooden table, with shelves underneath filled with an array of books, magazines, newspapers etc. 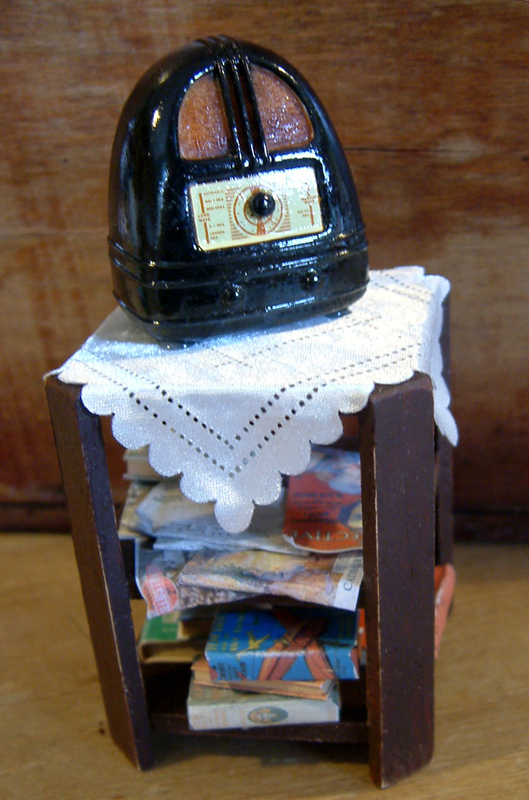 These would suit either a reproduction or vintage dolls house. 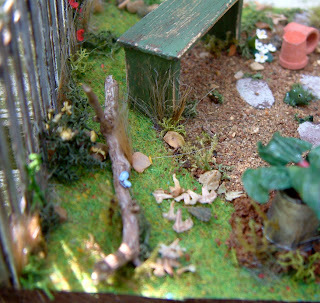 THE SHED, OUTHOUSE & OUTSIDE PAGE. 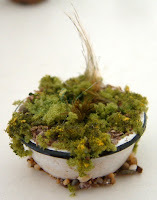 Just listed today on there are some more new creations. 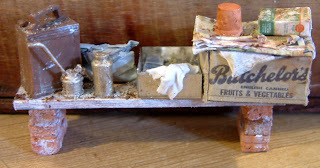 There is an old white painted and aged shelf standing on some tiny white washed bricks and filled with an array of rusty cans, a tin, boxes etc. It's versatile in so much as it can stand on the floor, a cupboard top or workbench in your mini shed, outhouse etc. 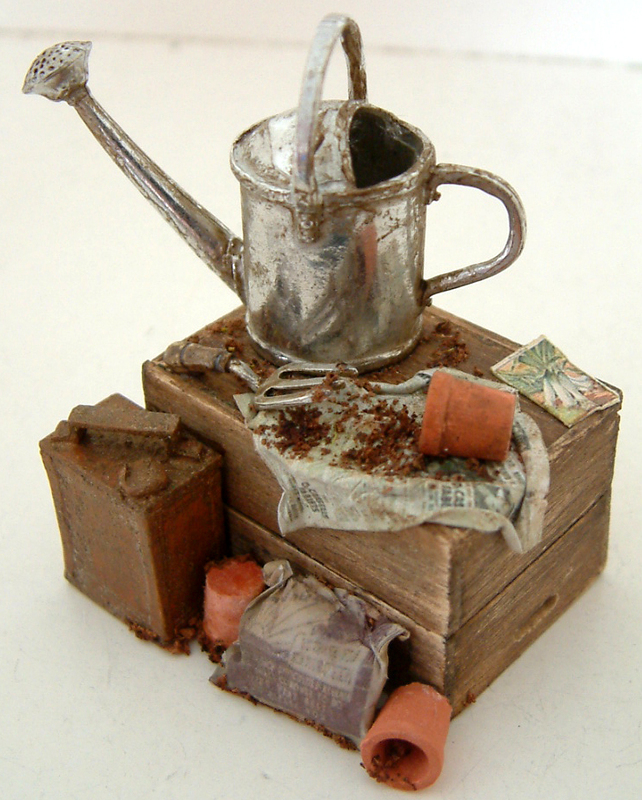 Also, there are two little set pieces that include some rusty cans, aged bricks and an assortment of foilage. Have been great fun to do!These could sit by your dolls house back door, backyard, garden or even by your little shed, outhouse etc. 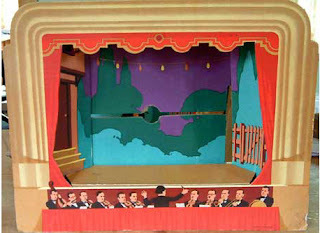 NOSTALGIA IN MINIATURE WORKSHOP WEBSITE - Brand New!!! Apart from Robin Britton of Coombe Crafts and I being great friends, we also share a passionate interest in creating miniatures that have a real nostalgic feel with that much loved, well used and realistic look. 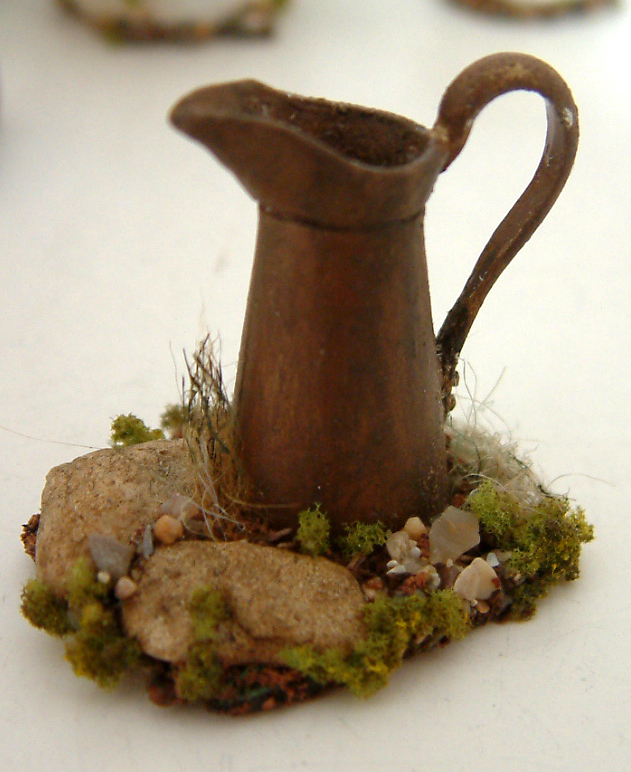 As experienced professional miniaturists, we have both enjoyed collaborating on numerous miniature projects over the years. Consequently it just seemed a natural progression to use our different but complementary skills in a series of workshops for enthusiasts who would like to create an original scene of their own, sharing in our ideas and expertise within a relaxed atmosphere. 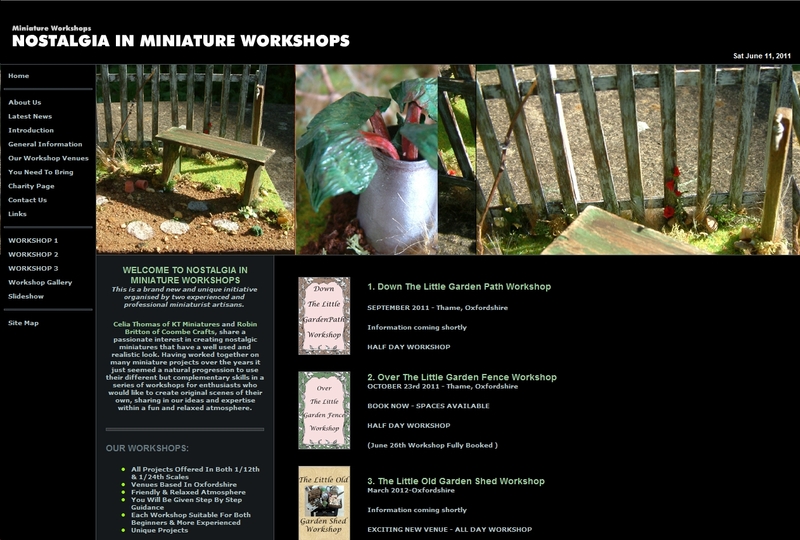 You will have seen us advertising our Over The Little Garden Fence Workshop on here and our respective websites/blogs, however we are now expanding our workshop venture and combining it all onto one single website under the heading "Nostalgia In Miniature Workshops". We will be offering a series of half day workshops based in Thame however shortly will be announcing a very special all day workshop to take place next March at an exciting Oxfordshire venue!!!! Nostalgia In Miniature Workshops own website's Latest News page will be diverted through to it's very own new blog. So if you want to keep abreast of the workshop news hot off the press....do go take a peek. Just to let you know (if you didn't already) that the latest issue of the online DOLLS HOUSE PAST AND PRESENT MAGAZINE went live over the past couple of days. There are a whole range of features tackled in this issue...ranging from an 1890s German Pastry Shop, Restoration of a G& J Lines House ....even what is believed to be a Tri-ang Hospital....AMAZING.... plus lots more! 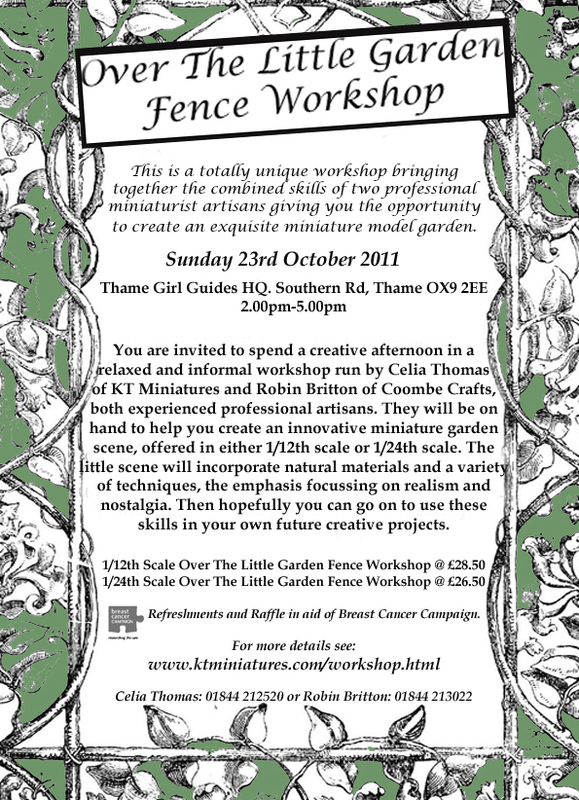 What is even more brilliant is that Rebecca Green, editor of the magazine, embarked on a little bit of sleuthing and has managed to find out all sorts about the company that made this theatre: Mathews & Co.
NEW OCTOBER DATE- "Over The Little Garden Fence Workshop"
Just to let you know that due to our first "Over The Little Garden Fence Workshop" (June 26th) being a sell out with all places snapped up within 4 weeks, we are now running this all over again on Sunday 23rd October 2011. 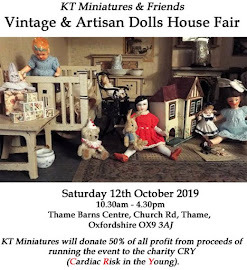 So if you fancy coming along to Thame in Oxfordshire for a creative afternoon and make a nostalgic little garden scene in a friendly, relaxed and informal atmosphere with Robin Britton of Coombe Crafts and me .....Celia of KT Miniatures - we would love to hear from you. 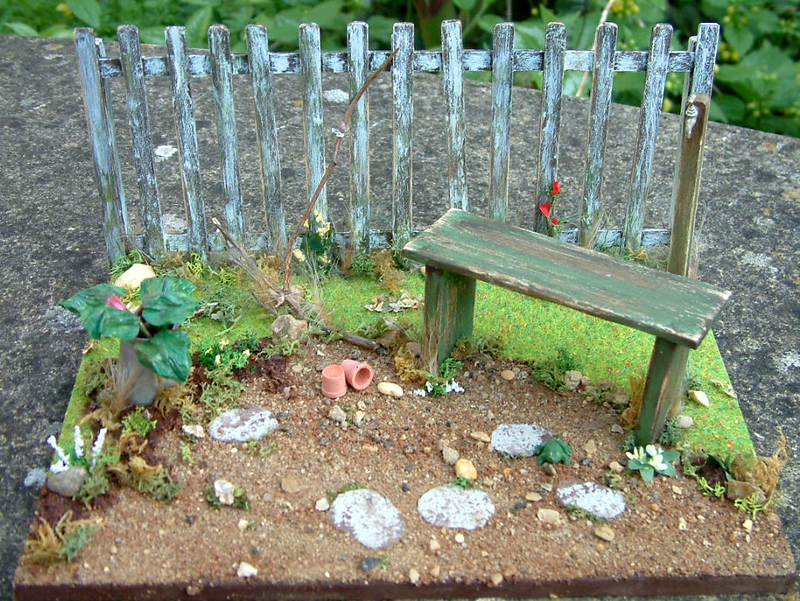 We are offering a 3 hour workshop where you can create a unique and nostalgic little garden scene for just £28.50 in 1/12th scale or £26.50 in 1/24th scale. Places are limited so it is advisable to book early to avoid disappointment. The emphasis will focuss on nostalgia and realism, using a variety of materials and techniques. 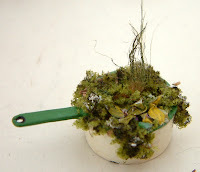 Robin and I hope that not only will you leave the workshop at the end of the day with a wonderful little model garden but that you will also be inspired enough to be able to use the new methods learnt in your own future miniature projects too. 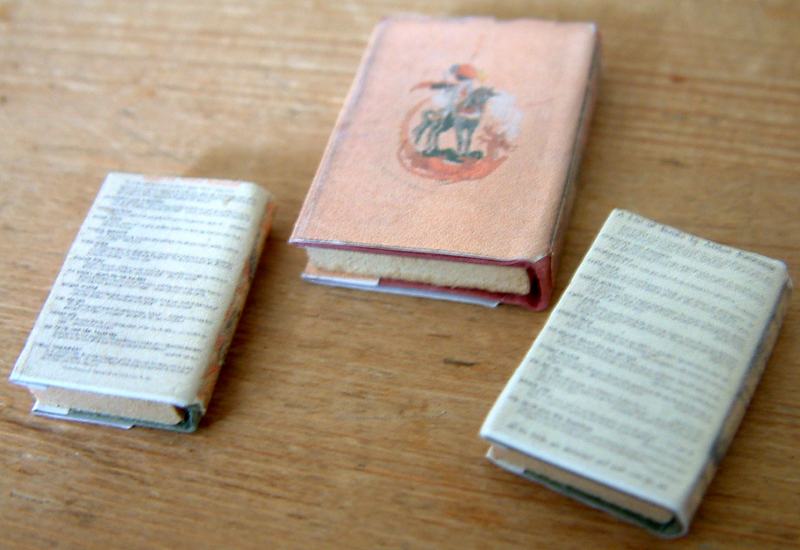 At long last I have been able to re-create some sets of vintage children's books in 1/12th scale, sorry no pages but just wooden inserts.... therefore for effect only. However I have made them with tatty dust covers to add to the well used and much loved look. 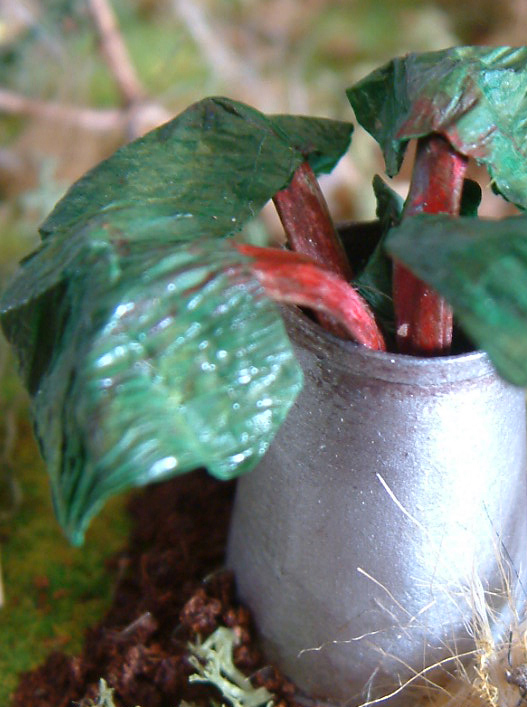 They are now up for sale under KT Miniatures Exclusive Items...on the Childhood Page. The Golden Wonder Book is being sold with two other much loved 1930s children's books - as seen in photo below. (The other two books were my step-mum's as a child). A few weeks ago, to celebrate one whole year of blogging, I had a competition of which the prize was some vintage books including a 1930s Golden Wonder Book. At the time, I had several enquiries about this specific book and subsequently promised that I would make some to sell.....sorry it has taken me so long to get down to this. 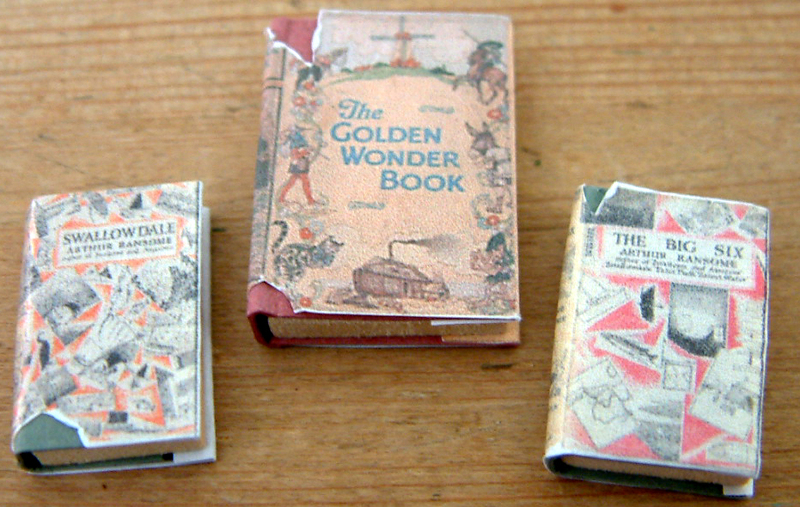 Growing up, I had my lovely step-mum's Golden Wonder Book and I absolutely adored it. I remember as a child being totally captivated by the illustrations and fairy tales. However sadly, as one grew up and moved house a few times, it became lost along the way...as they do (still not sure how). Then one day, I happened to be perusing our local Oxfam Book Shop here in Thame (can highly recommend it - is a real treasure trove) and stumbled across the book by accident. This book is a real collector's item these days and even though the cover was in bad condition I just had to buy it (was expensive though). 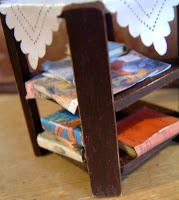 There are several of these sets available plus some other sets of 1930s-40s books, including a set of four boys books - all with dusty covers (some tatty). 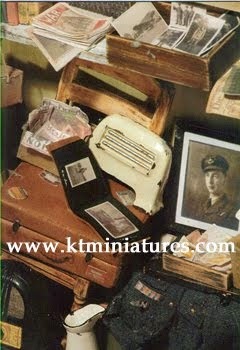 ALL OF THESE CAN BE USED IN BOTH REPRODUCTION AND VINTAGE DOLLS HOUSES.